Hosted by the University of California, Santa Barbara’s Young Americans for Liberty, popular writer and self-proclaimed “professional truth sayer” Matt Walsh delivered a lecture titled “An Encroachment on Liberty: How the Left Exploits Transgender Laws” on Thursday, May 5, to a group of approximately 70 attendees. Walsh’s view toward the increasing number of laws made or amended to accommodate the transgender community is one of harsh opposition, and from the beginning Walsh made it clear that he is not one to mince words. “There is, to me, no greater expression of this collective insanity in our culture right now than our devolving understanding of gender,” Walsh told the group. According to Walsh, the natural lines along which society understands gender, ones he claimed to have learned in his second-grade biology book, are in the process of being deconstructed by leftist politicians — and it is this betrayal of natural law that constitutes the current modern-day crisis of transgender laws. Walsh argued that transgender laws are also a leftist expression of “tyranny” and “undermining liberty” and highlighted potential dangers of allowing opposite genders, including individuals who may be prone to perversion, to share bathrooms. He pointed to a recent case in Seattle, in which a man, who claimed to identify as a woman but whose appearance too closely resembled that of a man, was barred from entering the women’s restroom. Walsh emphasized that the individual was dressed in board shorts and had unshaved legs. Walsh’s stance on gender identification and reconstruction as problematic and ambiguous was one many in the audience seemed to agree with, as the room filled with snaps of approval. Walsh went on to call transgenderism a mental illness, brought on by the same sort of body dysmorphia experienced by those who are anorexic and bulimic. He delved into instances of bullying in the transgender community, pointing to one case in which two parents sued their child’s preschool after their five-year-old son, who identifies as female, was bullied by his peers upon arriving to school in a dress. The third pillar of Walsh’s argument was heavily steeped in his Judeo-Christian beliefs, as he advocated for a return to what is considered inherently natural within those bounds. According to Walsh, the high rate of attempted suicide within the LGBT+ community — which he estimated at approximately 40 percent — is a consequence of the “self” rejecting an unnatural state of being. Transgenderism itself is also an affront to the existence of God, he said, as it betrays the classic “uncaused cause” argument. Walsh asserts that the modern day belief that one can redefine one’s God-given identity, in which one assumes itself to be the ultimate cause, is impossible based on this philosophy. Another UCSB undergraduate listed off biological facts to dispute Walsh by highlighting the individuals allegedly rendered genderless by chromosome complications, while one older alumna encouraged students to remain open to all ideas. The controversial nature of Walsh’s views sparked backlash prior to the event within some circles on campus and social media. Those opposed to or offended by the ideas presented were encouraged by St. Michael’s University Church to attend its transgender solidarity meal held at the same time, though YAL continued to promote attendance at its talk by students of all viewpoints. Some of those who attended Walsh’s lecture had covered some ground to get there. 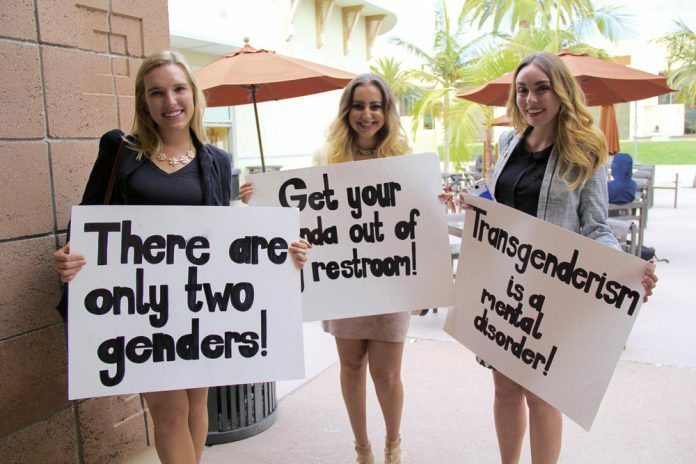 One woman reportedly drove over two hours to attend the event, and three members of UC Los Angeles Bruin Republicans and avid Walsh fans arrived in full support, touting posters with the words “There Are Only Two Genders” scrawled across the front. “Leftists hate him and for good reason,” Flores said. “He boldly and unflinchingly tells the truth”. Several police officers and five CSO members stood outside the event space for the duration of the night, while flyers reading “Keep Bigotry Where It Belongs” with images of YAL’s own event flyers submerged in a toilet, were placed in several rows of the event space. As part of its continued efforts to spark discussion on controversial viewpoints, YAL will host Milo Yiannopoulos and his “Feminism is Cancer” tour at UCSB’s Corwin Pavillion on May 26. Following Thursday’s event, third-year economics and accounting and French double major Steven Kwok said that although he didn’t agree with the sentiments expressed, he didn’t regret attending.